(*) 874 people have given a 5 stars rating to the Customizr theme as of , which makes it one of the best reviewed theme on the WordPress.org repository. 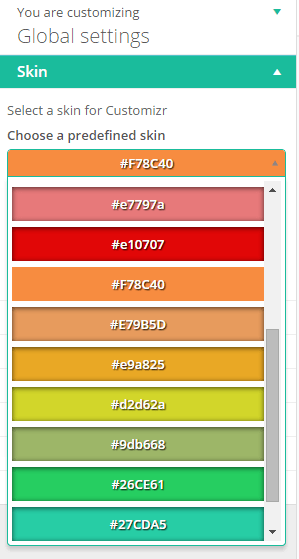 How to use the Customizr theme on your website ? The Customizr WordPress theme is free. Installing it takes only a few clicks. (*) if you are new to WordPress, head over to this quick introduction : What is a WordPress theme and how can I create my website with it ? The Nimble Builder is a free plugin hosted on wordpress.org. It’s a lightweight section builder intended to be the content creation companion of the Customizr theme. It allows you to drag and drop pre-built sections, or create your own sections, in live preview from the WordPress customizer. See a live example of a page built with Customizr and the Nimble Builder. Hundreds of Customizr fans can’t be wrong. WordPress is probably one of the best tools to publish and organize content (CMS) in the world, but a website is not only about content, it’s also about design. That’s where the Customizr theme comes in. The Customizr theme is a tool to bring design to your WordPress content. When developing the Customizr theme, the first step has been to analyze the most frequent requests from my clients and to understand what makes a layout and design engaging for their visitors. Everyone has a specific design need for his or her website. A small pizza restaurant in Rome will obviously not target the same audience of a large private equity company based in San Francisco. But ultimately, the goal of those two very different websites will still converge in the way that they need to present what they do in the most impactful and engaging way, hoping that a visitor will stay as long as possible, and could even be converted into more than a simple visitor : client, follower, recurrent visitor, etc. Since there’s no such thing as bug-free software, we have our eyes peeled for any unknown or future bugs. If you have a question about Customizr, chances are it has already been asked and answered in the 10 000 + topics on the Customizr theme forum. The Customizr theme is hosted on the WordPress.org theme’s repository. To be accepted on this repository, a theme has to respect detailed requirements and guidelines to ensure maximum security for its users, and to be compliant with WordPress best coding practices. Each time a new version is submitted, it goes through a control process with hundreds of automated checks, a final manual test, and an approval made by an administrator of the theme review team. 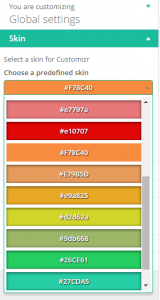 Since its inception, the Customizr theme has been designed to be easily customizable and extendable. The first level of customization can be accessed from the WordPress admin area, in Appearance > Customize. There you’ll find a set of options allowing you to change your site’s appearance in real-time. With 135 + different options to choose from, the theme offers endless possible combinations of unique webdesigns. Jump to the documentation to discover all the customization options included in the theme. For designers, Customizr offers a live Custom CSS field to test and apply simple style modifications. For more complex style changes, the Customizr theme is child-theme ready and there’s no limit to overriding and extending the default CSS stylesheets of the theme. Customizr is licensed under the GNU GPL v2 or later. You can use it for commercial or non-commercial projects. First of all, Customizr would never have existed if WordPress had not been created in 2003 by the very inspiring Matt Mullenweg. Thanks go to him for developing the best CMS in the world! The people below are all volunteers or developers who share their amazing code with the world. Thanks to Dave Bardell for his awesome work and advice on creating and maintaining this documentation.